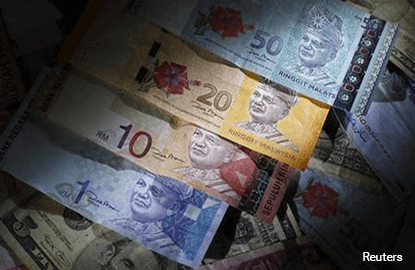 KUALA LUMPUR (Aug 11): The Malaysian ringgit breached its 17-year low figure of 3.9365 against the US dollar, trading at levels of 3.9405 against the greenback at time of writing. According to Maybank Foreign Exchange (FX) Research, the ringgit's continued weakening was due to US dollar-Chinese Yuan (CNY) fixing at a much higher rate this morning, which caught the market by surprise. "People's Bank of China commented that this is a one off adjustment," said Maybank in a note today. The research arm added that the US dollar-ringgit levels are still attributed to falling FX reserves, and according to local reports there are no plans to peg the currency back to the greenback. On the ringgit's outlook, AmBank FX Research said that it expects the ringgit to trade in the range of 3.9110 to 3.9650 against the US dollar today. "This morning, the ringgit opened at 3.9355 against the US dollar, if the resistance of 3.9560 is breached, we expect the ringgit to trade higher to 3.9680, if the support of 3.9110 is broken, the next support is at 3.8960," said AmBank in its note this morning. At 11.02am, the ringgit had weakened further to 3.9510 against the greenback. The ringgit, however, showed its strength against other currencies this morning. For one, the ringgit had a stronger showing against the Singapore dollar, trading at levels of 2.8279 at time of writing, from levels of 2.8486 yesterday. The currency also came out stronger against the Australian dollar (AUD), trading at 2.8914 against the AUD from its closing price of 2.9205 yesterday. The ringgit's performance against the euro remained unchanged this morning from its closing price yesterday of 4.34. However, against the British Pound, the ringgit was trading at weak levels of 6.1453 from its closing of 6.1386 yesterday.